Let yourself be seduced by Porto, Portugal’s second largest metropolis, and one of Europe’s most charismatic cities, that has become known for its monuments by renowned architects like Gustave Eiffel, Nicolau Nasoni, Rem Koolhaas, Marques da Silva, Siza Vieira and Eduardo Souto Moura, among others. 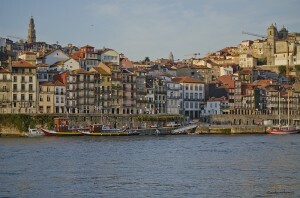 Porto is also the city that originated and named Port Wine. Get to know the historical centre with its beautiful places and monuments. Explore its enchanting old streets, the beautiful riverside and its several kilometers of beaches that open the city to the Atlantic sea. 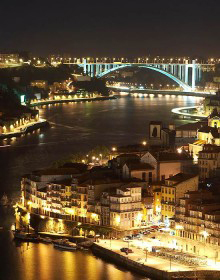 Get ready to enjoy the fascinating nightlife in Porto. 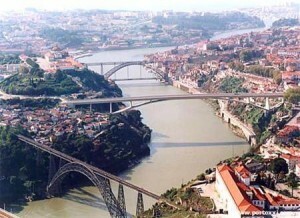 Within walking distance from Porto Lounge Hostel & Guesthouse you can find all the cities’ most important attractions. 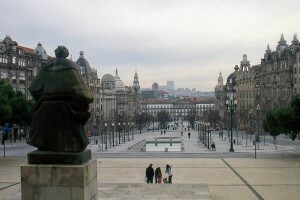 The monumental central avenue, just a few steps from Porto Lounge, is the heart of the city. English Barry Parker began its construction in 1915 and the architect Marques da Silva finished it. Marques da Silva studied architecture in Paris and all his works are influenced by the French School. This harmonious and beautiful avenue is lined with grand buildings, most of which are hotels or banks, and a central promenade. It was remodelled in 2006 by renowned architect Alvaro Siza Vieira. All buildings are of good granite, many of them crowned with skylights and domes. On the upper side of the Avenue stands the Town Hall, a palatial building made of granite and marble with a tall bell tower (70m high). Near the Town Hall there’s a water mirror surrounded by benches, chairs and trees. The magnificence of the whole architecture and its central character make it a “living room” of the city, the place where the people from Porto gather to celebrate the special moments. There are also several cafés, including the historical Guarany. Sit at one of the tables outside and watch the world go by. 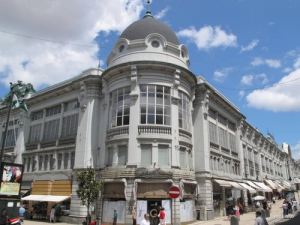 Inaugurated in 1916, the project of this historical station was entrusted to architect José Marques da Silva, who designed a building under the influence of French Beaux-Arts architecture. 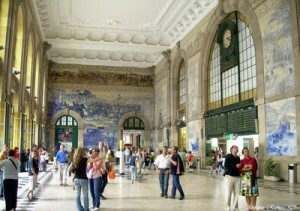 Famous for its large, magnificent tile panels in the hall depicting scenes of the History of Portugal, it is listed amongst the 16 most beautiful railway stations in the world. The tiles number 20,000 and are the work of Jorge Colaço, the most important tile painter of the time. In this austere fortress-like cathedral was baptised Prince Henry the Navigator and King John I married the English Princess Philippa of Lancaster in 1387. The building has its origins in the 12th century, although it underwent many alterations over time. The Gothic rose window is the only part of the original façade that remains, especially after Baroque alterations in the 18th century. The cathedral is flanked by two square towers crowned with a cupola. The façade is rather architecturally heterogeneous, showing a Baroque porch and giving the impression of a fortified church. Despite the alterations, its overall façade remained Romanesque, particularly its interior that was also altered during the baroque era. In one of the chapels there is a magnificent silver altarpiece, built in the second half of the 17th century. Also in the 17th century a new apse was built in baroque style, later decorated with new wall paintings by Nasoni and choir stalls. 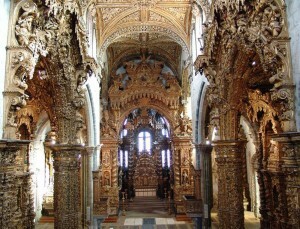 The altarpiece of the chapel, executed between 1727 and 1729, is an important work of Portuguese Baroque.The Gothic cloisters built between the 14th and the 15th centuries during the reign of King John I are more outstanding than the church itself, decorated with baroque blue and white tiles from the 18th century. Nicolau Nasoni, the world-renowned Italian architect, altered the lateral façade of this historic church by adding a Baroque-style loggia. 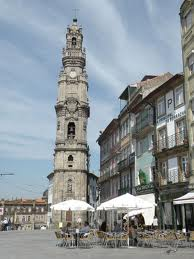 The most prominent Gothic monument in Porto, also noted for its extraordinary Baroque inner decoration. 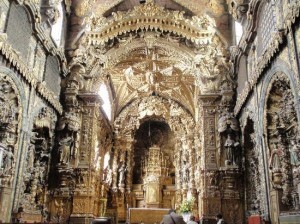 Most of the surfaces of the interior of the church, including walls, pillars, side chapels and roof, are covered with gilt wood work in Baroque style. An interesting chapel is the one dedicated to Saint John the Baptist built in the 15th century, with a Baroque altarpiece representing the Baptism of Christ. Clérigos church tower can be seen from various points of the city and is considered by many the symbol of the city. 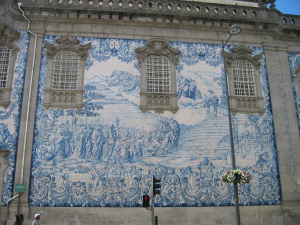 It was designed by the Italian architect and painter Nicolau Nasoni and has a baroque decoration. The tower is 75.6 metres high, dominating the city. It’s worth climbing its 240 steps to reach the top and enjoy the aerial view of the city. You can view not only the centre of Porto, but also the city of V. N. Gaia and the Douro River flowing into the sea … A Must See! Inside the church, a Baroque work of the first half of the eighteenth century, particularly noted for its unusual oval shape, there is a remarkable polychromatic Baroque-Rococo marble retable. The purpose-built bookshop, inaugurated on January 13, 1906, is one of the most beautiful bookstores in the world, with its stunning architecture and interior design. The façade is an excellent neo-gothic design. The two figures on both sides of the large central window represent Art and Science. The interior, on two levels, has a stunning decoration with – stained glass, carved wood, pressed copper, glass-enclosed bookshelves arched at the top, and the amazing staircase with red coloured steps. The bookstore where Harry Potter is supposedly to have first been imagined up by JK Rowling is definitely a must-see in Porto. Dating from the early 15th century, it is an impressive rococo and baroque masterpiece. The rather austere exterior contrasts with the richly embellished interior from the 18C. It is particularly noted for the quality of the exuberant gilt wood work combined with the tile paneling. 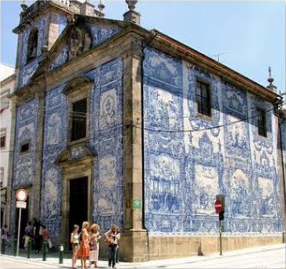 Carmo Church, built in the 18th century, is a magnificent example of late baroque architecture with a single nave made up of elegant gilt carvings in seven altars.Outside, an extraordinary side wall is completely covered in blue and white tile panels. On the left, only separated by a very narrow house (only about a metre wide), is Carmelitas Church, part of a former 17th century convent with a simple classical façade, a bell tower and a richly gilded interior. This charming blue and white chapel built in the 18th century was given a remarkable tiled decoration all over its exterior walls in the early 20th century. The panels depict scenes from the life of St. Francis of Assis and St. Catherine. 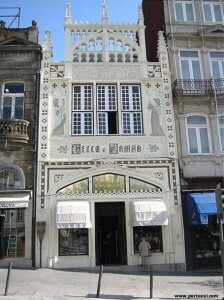 Built in 1885, it represents an important example of iron architecture in Porto. It operated as a market for a very short period of time, having been used for various purposes. It was later renovated to become an entertainment venue. It is classified as a Monument of Public Interest. Located in the heart of the city, this noisy and exuberant market is a sight not to be missed. It’s found in a two-tier covered building and sells basically everything, from household goods to fresh fruits and vegetables. It’s an excellent example of commercial civil architecture, showing strong features of the late neoclassical style. A city landmark, it is considered the sixth most beautiful coffee shop in the world. Established in 1921, it has traditionally been the hang out of artists, musicians, politicians and other intellectuals. 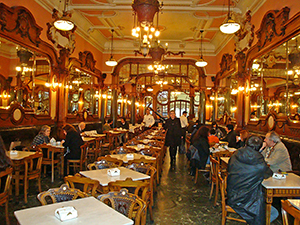 From its façade to its interior, this café is an architectural jewel which has been meticulously restored and remains a beautiful setting for cultural events with a wonderful Belle Epoque atmosphere in its main room where marble walls, gilt framed mirrors, sculptured cherubs and ornate Art Deco décor abound. There is also terrace seating and an interesting rear courtyard. A magnificent example of 19th century Neoclassical architecture, this palace now houses the Commercial Association of Porto. 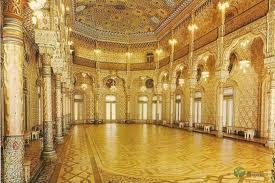 Take the tour so you won’t miss the impressive Arab Room which is now “the grand reception room” of the city where heads of state are received on a visit to Oporto. Another noteworthy room is Pátio das Nações, lit by a large skylight that is a magnificent example of iron architecture. There is also a remarkable grand staircase with two bronze chandeliers hanging from the cupola. The most picturesque spot in the city, a UNESCO World Heritage site full of narrow twisting streets. At Praça da Ribeira have a refreshing drink or a meal in one of the numerous cafés, bars and restaurants and enjoy the atmosphere of this charismatic medieval quarter with its colorful houses facing the river and its picturesque boats. From here you can admire the attractive Cais de Gaia riverfront, cross Dom Luis bridge and visit the Port Wine cellars. 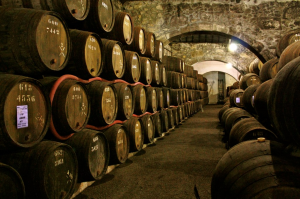 Most of the world’s supply of Port wine is stored and aged there, and a visit to any of the warehouses to taste the famous Port Wine should not be missed. If you are coming to Porto, a visit to a wine cellar is a must. Most of the world’s supply of Port is stored and aged there. 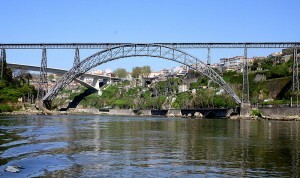 They are located on the other side of the Douro River, opposite the city centre. There are more than 50 port wine cellars and most of them offer tours throughout the day in different languages around their premises. Take the guided tour through the wine lodge and toward the end of the tour enjoy the cozy atmosphere where you can set back and relax while tasting a varity of Port wines. One of the best ways to discover the city is to take a cruise upriver. From Cais da Ribeira or Cais de Gaia you can opt for a 50-minute trip that costs about 10€ and view the city of Porto with its 6 bridges (Maria Pia Bridge, Dom Luís Bridge, Arrábida Bridge, São João Bridge, Freixo Bridge and Infante Dom Henrique Bridge). If you’re not on a budget, you may also choose a day-long cruise for a higher price. These 1-day river cruises explore both the city, the Douro Valley and the Portuguese countryside. Go at least as far as Pinhão – the landscape is absolutely stunning. 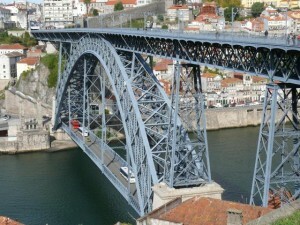 The most famous bridge spanning the Douro between Porto and Vila Nova de Gaia, designed in 1886 by Teófilo Seyrig ,a disciple of Eiffel, holds the record for the longest iron arch in the world and has been classified as a UNESCO World Heritage site. Today the metro crosses the upper level, while the lower level is used by cars and pedestrians to cross the river between the center of Oporto and Vila Nova de Gaia. From the upper level there is an amazing view over Ribiera and the Porto Wine Cellars of Villa Nova de Gaia. The ancient and impressive Maria Pia railway bridge was built by Gustave Eiffel (before he built the famous Paris tower) and Theóphile Seyrig in 1877 and at that time was the longest arch bridge in the world (160m). It remained in service until 1991 but today it stands as a national monument. 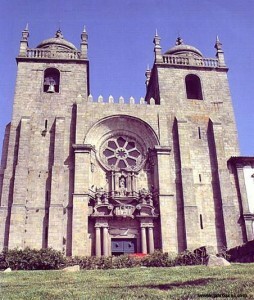 It was named after Queen Maria Pia of Portugal. This twelve-storey, irregular-shaped building was designed by world-renowned architect Rem Koolhaas exclusively for musical performances. 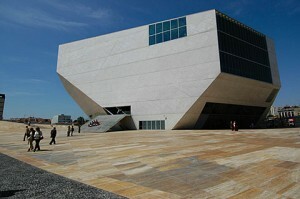 It opened in 2005 and for admirers of architectural marvels it justifies a visit to Oporto on its own. In 2007 it won the Royal Institute of British Architects’ (RIBA) Award, the jury describing the building as “intriguing, disquieting and dynamic”. Top international orchestras have already played here, and there is also a resident company. 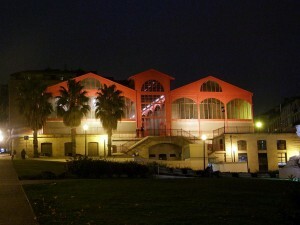 The building houses a 1300 seat main auditorium, rehearsal space and recording studios for the Porto National Orchestra. On the top floor is one of the most sophisticated restaurants in the city. You can see it all in a highly recommended guided tour. Situated in the centre of Oporto, Serralves houses a contemporary art museum, a park and an Art Deco villa, together with leisure facilities, shops and restaurants. 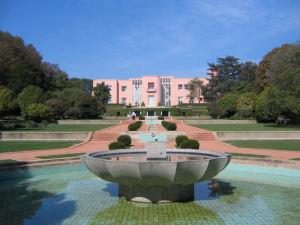 Serralves Villa, built during the 1930s, constitutes one of the finest examples of Art Deco architecture in Europe. In rigorous respect for Marques da Silva’s original project, it hosts exhibitions, events and other activities. It is situated in Seralves Park, a singular example of landscape art in Portugal, stretching harmoniously over 18 hectares of magnificient gardens and including a traditional farm and even a wood. Designed by well known Portuguese architect Siza Vieira, the Contemporary Art Museum presents temporary exhibitions featuring leading national and international artists and is integrated within Europe’s leading contemporary art circuit. From Porto Lounge Hostel & Guesthouse catch the riverside tram to the sea. Walk along the several kilometres of coves and beaches at “Foz”. In front of Molhe Beach, characterized by its sumptuous stairway and for its many bars and esplanades, stop under the pergola to appreciate its amazing architecture and the beautiful view to the beach and the sea. 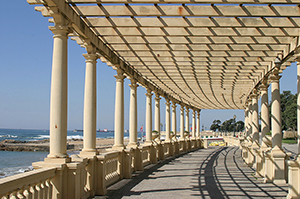 In the summer sit in one of the numerous esplanades, walk by the sea or take your beach towel and enjoy the sun! The beaches are fine, some of them present a good sandy area extension and sheltered bathing areas are marked out. The rocky areas shown in between tides are another feature that these beaches are quite well-known for. © Copyright Porto Lounge Hostel & Guesthouse. Powered by Jumpseller.